It is vital to remember is that one size does not fit all with roof coatings. There is no “miracle-in-a-bucket” and a quick seemingly inexpensive fix may result in more repairs and higher costs later. Energy efficient roofing is no longer a trend, and has moved fully into the mainstream of facilities management in the United States. But the financial benefits and sustainability of energy efficient roofs can be compromised if repairs and coatings applications are done poorly. That is why it is important for facility managers to make sure the contractors who install or repair roofing are properly trained. The new, energy efficient coatings available today require knowledgeable contractors and crews who understand, and are well-practiced in, applications that result in maximum longevity. Steve Pfingsten, a branch manager for ABC Supply Company in Rockford, Illinois has seen first hand the benefits of up-to-date crew training. He previously operated a coatings factory and now works with roof coatings application crews and contractors who come to him for help. Over the years, he says, they have become "converts" to the need for high quality instruction focused on the newest coatings technology, and the best application techniques. His job is to offer them current instruction about different coatings, application methods and the need for well–ss atched repairs; the vital first step in maintaining roof longevity. Because there are significant differences in the training programs offered by various roof system and coating manufacturers, understanding the standards for high-quality applications will help facility managers avoid problems that compromise energy efficiency goals. Because a poor repair job can undermine the overall coatings application and defeat the goal of energy efficiency, Pfingsten says that contractor crews must first know how to evaluate and use proper techniques for fixes. An unsound metal roof for instance, might have loose or missing fasteners, deflection of the roof deck at seams, and/or ponded water behind protrusions such as vent stacks. These must be repaired prior to the application of acrylic roof coatings. Also, how a roof is repaired prior to coating can affect warranties, so facility managers should make sure repairs are being done according to original roofing system manufacturer specifications or the warranty could be voided. Throughout the process, contractors should be expected to follow guidelines developed by the National Roofing Contractors Association (NRCA) to evaluate roof sound-ness and appropriate materials and techniques for repairs. After repairs are identified and completed by a professional roofing contractor, the coatings application crew must perform an adhesion test before applying the coatings. Not all coatings adhere to all roof types and coatings are specifically developed and manufactured to match the surfaces on which they will be applied. This is especially important with metal roofs, since they may not accept certain coatings. For example, some metal roofs have a factory-applied Kynar ® 500 finish which is a Teflon ® –based paint and depending on the age of the metal, could require sanding to create a surface the coating can adhere to. Galvalume ® and galvanized finishes may have residual zinc that needs a mild acidic solution applied first to prepare the surface. Also, on metal roofs it is critical that all flaking rust must be removed and a special acrylic rust-inhibiting primer applied before the acrylic finish coats are applied. If silicone materials or caulk have been used for prior repairs they must be removed from roofing surfaces before applying acrylic coatings. Also, before new coatings can be applied a general cleaning of the roof surface must be completed following the manufacturer recommendations. It is vital to remember is that one size does not fit all with roof coatings. There is no "miracle-in-a-bucket" and a quick seemingly inexpensive fix may result in more repairs and higher costs later. Well-trained contractors understand that all coatings are not equal and therefore must be carefully matched to the roof. This is particularly important with professional grade white coatings, which are commonly used to increase energy efficiency. "Off-the-shelf" roof patch materials should be avoided. Professional grade coatings are required for good performance because these coatings are truly elastomeric, stretching as the roof substrate moves due to expansion and contraction of the building and then returning to their original shape without deformation. Beyond repairs, maximizing roof life and energy savings also depends on the use of proper equipment. As with all jobs, getting it done right means using the most appropriate tools to maximize efficiency and ensure quality. Different coatings may have different equipment requirements; therefore contractor crews must be current in their education and training. Coatings applicators may use airless sprayers, rollers or brushes depending on the type of coatings, the surfaces being coated and climatic conditions. An educated coatings crew has special expertise such as understanding which diameter wide-angle fan pattern spray tips to use with an airless spray rig so a consistent mil thickness results. When crews have been trained well they are also better able to judge thickness, one of the single most critical factors in a coating job. An uneven application can show up within weeks, when spots on the roof begin to bubble and peel. It is appropriate for facility managers to check with crews to ensure they use a wet mil gauge to monitor proper mil thickness in each coat. The coatings crew should know the proper coverage rates per gallon and the number of coats recommended by the coatings manufacturer to achieve the mil thickness desired. Facility managers should also expect the crew to have an application hand-book at the jobsite at all times so the important specifics of the job stay on the roof instead of back at the contractor’s office in a large binder or inside somebody’s memory. Needless to say, training for rooftop applications cannot be done from a textbook. Pfingsten believes there is no substitute for hands-on experience with equipment, which manufacturer’s training should provide to applicator crews. In his experience, the best coatings crews are the ones who are actually trained on the roof or on a high-quality mock-up. The frequency of training is also important. Turnover on crews can be significant and Pfingsten has observed that coatings companies with multiple locations can help building managers ease turnover issues ensuring that contractors are continually training new people, he says. He also sees that facility managers need to be able to get help and roof products near their own locations and urges them to work with manufacturers who have a broad presence, as well as longevity (so they can take advantage of 10-year roof coating warranties). Pfingsten says, too, there is a direct correlation between the availability of the coatings manufacturer´s representatives and the quality of training they can offer crews. He feels strongly that crews are better trained when manufacturer´s reps are on the jobsite and do the training. He also assures that application crews can be trained quickly noting that an experienced trainer can go out on the roof and train a crew in less than a day. 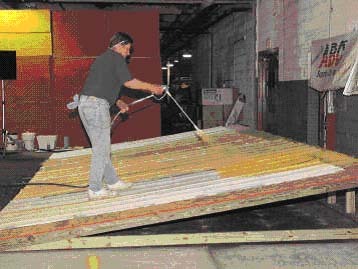 To find out the level of crew training, facility managers can ask the roof contractor or crew foreman what kind of instruction the crew has had, how often they are able to attend sessions with roof coatings manufacturers and if the selected manufacturer offers field training so that "best practice" techniques are updated frequently. Contractors who are current in coatings education should be more than willing to share that information, Pfingsten says. Facility managers who work hard toward energy efficiency will find that hiring well-trained crews helps meet that goal, ensuring a quality application of roof coatings, maximizing the life of the roof and increasing financial savings for their institutions.